Before appearing on the BBC's The Great British Sewing Bee, Chinelo Bally had never used a sewing pattern. She wowed the judges with her ability to create stylish, fitted garments using a freehand cutting method that was taught to her by an aunt. In Freehand Fashion, Chinelo lets us in to the secret of how she does it. Using a series of basic garment blocks, she explains how this innovative technique can be used to create a whole wardrobe of fashionable clothes that will fit every shape and size - with no patterns required. Based on a traditional Nigerian technique, Chinelo has developed her own freehand cutting method. The emphasis is on the individual's own body measurements, and getting the perfect fit. This is a surprisingly simple technique that anyone can learn. No fancy equipment is needed - just a sewing machine, measuring tape, chalk and of course a good pair of scissors. 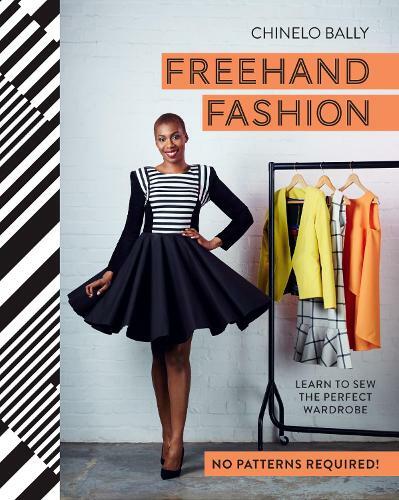 Using step-by-step illustrations, the book shows how to draft, cut and construct the five basic blocks that are used - either singly or in combination - to make every item of clothing in the wardrobe. Once you have your basic blocks, you are ready to tackle the projects - practical garments that are fashionable, modern, stylish and versatile. There are tops, skirts, day dresses and eveningwear. This is an exciting sewing technique that will be brand new to most people, even experienced dressmakers. There really are no limits - and the beauty of this technique is that it can be applied to any body shape.